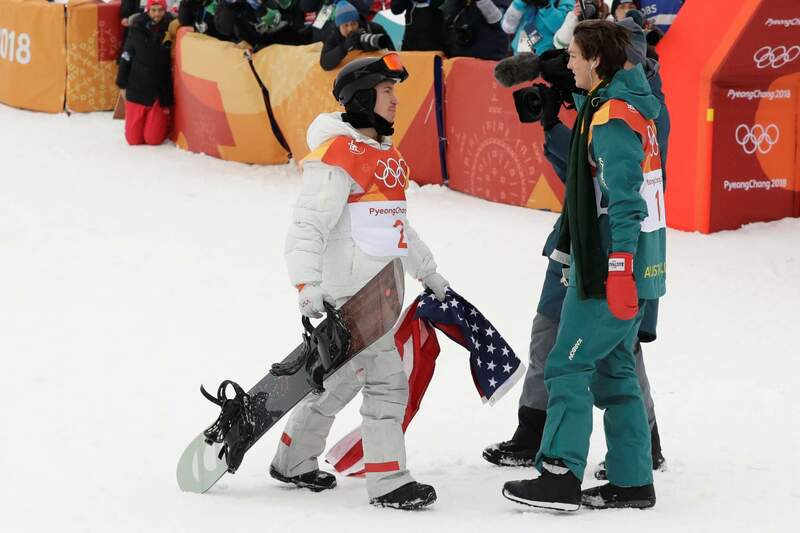 Shaun White,of the United States, left, celebrates his gold-winning run with bronze medal-winner Scotty James of Australia during the men’s half-pipe finals at the Winter Olympics in Pyeongchang, South Korea, on Feb. 14. Action Line has been around for 15 Winter Games but really hasn’t been paying attention, other than to laugh at how scandals always manage to taint ice-related events. This year’s Olympics was no exception, with a Russian curler being charged with doping. Um. It’s curling. That’s the sport in which a person pushes a rock across the ice while teammates sweep its path with brooms. What possible need does a curler have for performance-enhancing drugs? Good thing we never colluded with these cheaters and gold meddle-ists. In any case, let’s get back to athletes and flags. And who better to answer an Olympic question than someone who has been to them? Naturally, that person is our good friend Mike Elliott, a three-time racer in Nordic skiing. Mike competed at the Winter Games in 1964 (Innsbruck, Austria), in 1968 (Grenoble, France) and in 1972 (Sapporo, Japan). “I don’t remember anyone grabbing the flag out of the audience and waving it around. It just wasn’t done,” he said. Thus, Olympians wearing the flag like a cape is relatively new. And, to be curmudgeonly, just because something is “new” doesn’t make it good. Take MTV. Wait a sec. Didn’t MTV and the act of wearing Old Glory as an athletic victory prop start around the same time? Coincidence? Hardly! Therefore, it’s MTV’s fault that Olympians sully the colors. But let’s not let our attention flag. The 3,000-word advisory U.S. Flag Code covers flag etiquette. Google it. It’s worth reading. Action Line had to check on that one. Festooning is when suspended fabric is drawn together to form loops or scallops. So let’s impugn an inopportune buffoon who would festoon, particularly during a June afternoon monsoon. That’s a double whammy, festooning a flag and doing it during inclement weather, when flags should be taken in unless it’s an all-weather model. One final thing about Old Glory: A flag got Durango 15 minutes of fame years ago on the late-night David Letterman show. Action Line thought he’d run that joke up the flagpole and see if anyone salutes. Email questions to actionline@durangoherald.com or mail them to Action Line, The Durango Herald, 1275 Main Ave., Durango, CO 81301. You can request anonymity if you knew that Betsy Ross might not have sewn the first flag.